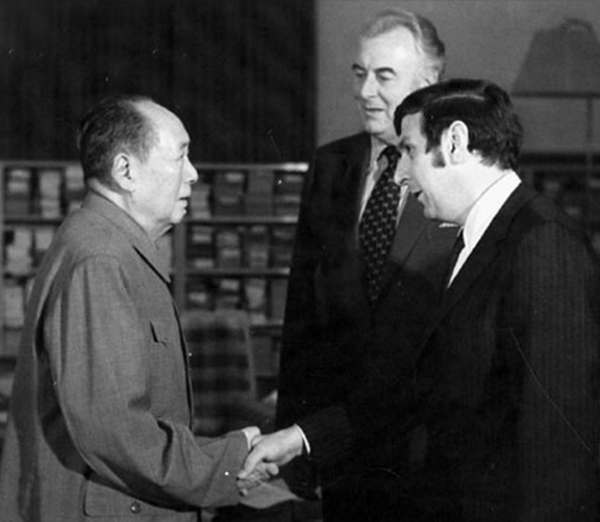 Stephen FitzGerald (right) and former Australian prime minister Gough Whitlam meet Chairman Mao Zedong on Nov 2, 1973, in Beijing. Editor’s note: This year marks the 40th anniversary of the launch of China’s reform and opening-up policy. China Daily talks to some people from overseas who have experienced or witnessed the important drive. 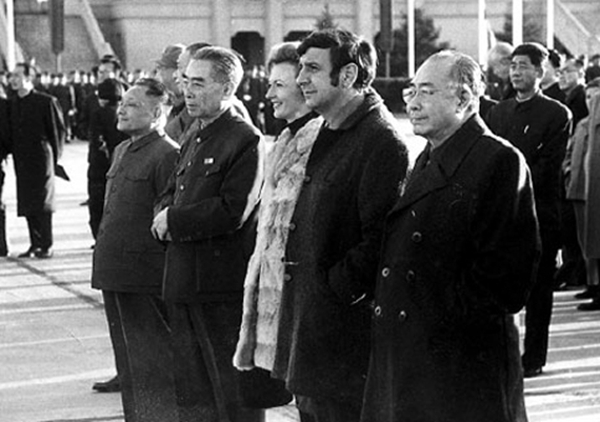 FitzGerald, Deng Xiaoping (left), Zhou Enlai (second from left) and Beijing Mayor Wu De (right) bid farewell to Whitlam on Nov 4, 1973, in Beijing. “What Whitlam wanted was diplomatic relations with China. He thought it irrational and illogical to keep on recognizing Chiang Kaishek’s government in Taiwan as the legitimate government of the whole of China. “He (Whitlam) saw the political and strategic importance of recognizing China. He saw this more than a political reality. He saw the strategic importance. “It’s what might now be called a narrative – how the relationship with China was imagined, and our goals for the long term, and what I should do to go about laying down tracks to head us toward those goals,” FitzGerald said. 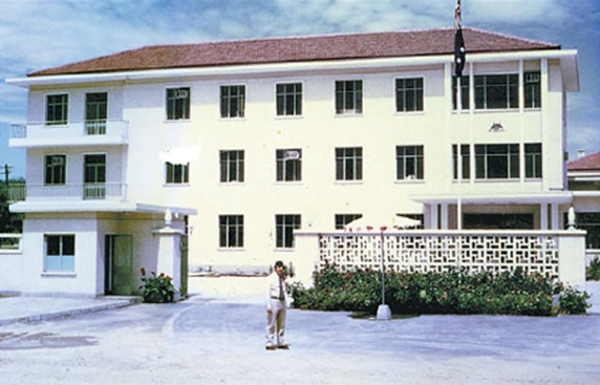 FitzGerald stands in front of the new Australian Embassy building in 1974. FitzGerald said that while Australia continues to follow the US line, it will never have an independent foreign policy, especially one that recognizes the new China. He said it is easy today to sit back and ask whether China needs more reforms – are the current reforms enough and should there be further, new reforms? Asked if he thought China would meet its two centennial goals – to become a “moderately prosperous society” by 2021 and a “fully modernized socialist country” by 2049, Fitzgerald said: “Hasn’t China already reached those goals? China has achieved prosperity. Look at the growing middle class. It is a fully modernized socialist country. Since the late 1960s, he has been involved in public policy development and reform in Australia’s relations with Asia and for an Asia-literate Australian society. He was professorial fellow and head of the Department of Far Eastern History and the Contemporary China Centre at the Australian National University, Canberra, in the late 1970s. In the 1980s, he chaired the Hawke government’s Asian Studies Council, which in 1988 developed a national strategy for the study of Asia in Australia. Since 2004 he has been chairman of the Griffith Asia Institute and research strategy director of the University of Technology Sydney’s China Research Centre. He is currently chairman of the independent public policy initiative China Matters, a distinguished fellow at the Whitlam Institute at the University of Western Sydney, and an honorary fellow at the China Studies Centre at the University of Sydney.